The white wooden keeper’s house and lighthouse tower, perched on the very tip of Wings Neck Point, gleam so brightly in the sunshine they almost appear to glow. Mere inches from the shore, the structures provide an unparalleled view of Buzzards Bay. It is this view and the love of lighthouses that lure visitors to this former keeper’s house, which now operates as a rental property. And that is precisely what Wings Neck is known for: its hardworking keepers who diligently served in this remote spot for many years. 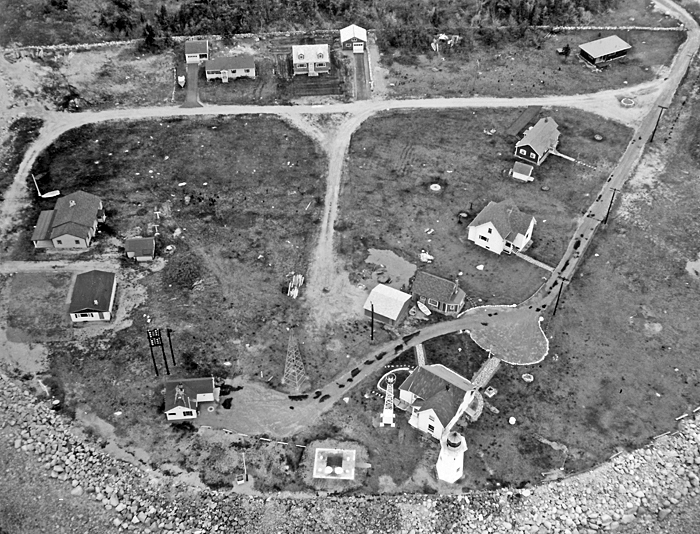 After much difficulty, we at last heard of a point or neck of land at the head of Buzzard’s bay, called …“Wing’s neck;'' and if this be the Wing’s neck for which Congress has made an appropriation of $5,000 to erect a light-house, we, decidedly, are of opinion that the commerce of all the places about the neck is wholly unworthy the expenditure of so large a sum of money, and, agreeably to your instructions, we offer our reasons: 1st. Bird's island light being only four miles from Wing’s neck is, we believe, all sufficient for the safety and facilities of navigation in this part of the bay. 2d. The whole trade to and from the inlets and harbors this light is contemplated to assist, consists chiefly of wood shallops. In the light’s favor were the prevailing winds of Buzzards Bay, which defined it as an excellent sailing destination on the Atlantic seaboard. Additionally, Pocasset served as the port for the town of Sandwich, where a major glass manufacturer churned out, amongst other products, the whale oil lamps that lit many New England homes. 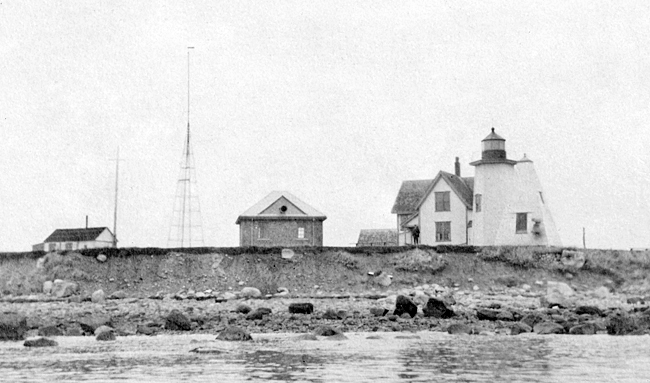 It was not until 1848, when Stephen Pleasonton, the Fifth Auditor of the Treasury, requested a lighthouse on Wings Neck that the long-planned light became a reality. Unfortunately, Pleasonton was well known for his penny pinching, and the original budget was slashed by nearly one-third to $3,500. Although it was possible in 1849 to buy nearly ten acres of land and for contractor John Vina to build a white, Cape-Cod-style stone keeper’s house topped by a hexagonal wooden tower and lantern for under $3,500, it may not have been enough to build a sturdy structure. Records show that the lighthouse, which ended up costing $3,251, needed renovation a scant eight years later. Its fixed, white light, set thirty-eight feet above the ground, was placed in operation on September 17, 1849 and could be seen for fourteen nautical miles. Lighthouse keeper positions were political appointments, and Edward Doty Lawrence received his appointment to Wings Neck in 1849 because his father, David Lawrence, a resident of Sandwich, was a Whig and a major campaign contributor to President Zachery Taylor. Positions were also lost as a result of elections, and Keeper Lawrence was removed from his post in 1854, shortly after the Democrat Franklin Pierce became President. Samuel Barlow has been appointed keeper of Wings Neck Light in Sandwich, in place of Edward D. Lawrence, removed. Mr. Lawrence was a faithful, capable man and was appointed at the time the lighthouse was built, no one being turned out to make room for him. His crime consisted in having been appointed by the Whigs. 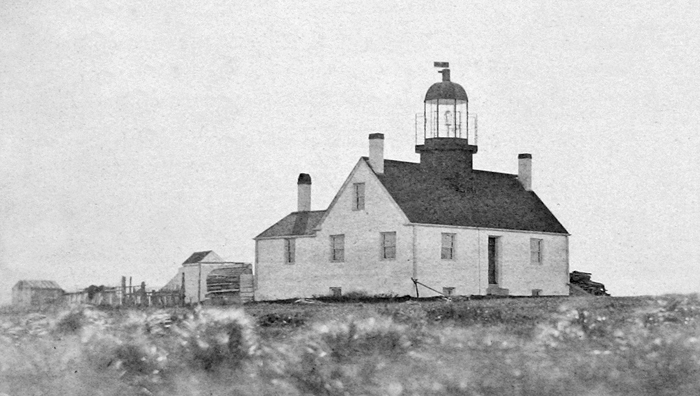 Changes to the lighthouse itself over the years were noted in the Lighthouse Board records, which show that in 1856 a fourth-order lens replaced the multiple whale oil lamps and reflectors. The entry for 1863 states that repairs to the building were completed, including the installation of a new lantern room. Records for 1878 show that it was a bad year for Wings Neck Light. Not only was the dwelling’s roof being crushed beneath the weight of the lantern, but a fire also caused substantial damage. Somehow the station was repaired and lasted until funds were approved in 1888 to rebuild the station. The annual report for 1890 notes: “The stone dwelling built in 1849 was torn down and replaced upon the same foundation by a framed dwelling 28 by 31 feet; a framed pyramidal tower surmounted by the old lantern was built for the temporary service of the light; a building, erected for the temporary accommodation of the workmen was adapted for use as a barn, and minor repairs were made to the out-buildings.” A covered walkway was built in 1899 to connect the dwelling to the nearby hexagonal tower, also built in 1889. 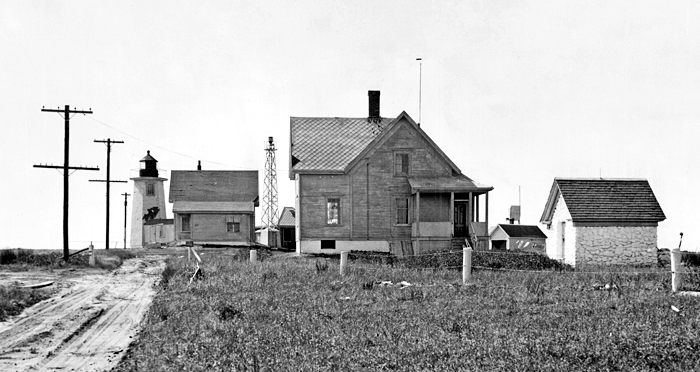 A pyramidal, wooden bell tower and a 1,000 pound fog bell joined the station in 1902. Alfred B. Gifford, who was Keeper Lawrence’s son-in-law and was said to have been “practically in charge of the light for the past eight years,” was appointed Lawrence’s replacement. Gifford’s wife, Carry, became his unofficial assistant keeper. Carry, or Caroline as she was named, was the daughter of Edward D. Lawrence. Alfred Gifford also remained keeper at Wings Neck until his demise. One mean and foggy night he died in his house. I hitched up my old nag and drove down there. Mrs. Gifford was alone [and] as I worked on his body, she carried on through that beastly, cold, foggy night, tending the light and clocking the fog bell. After finishing my work I stayed the night there. I could not leave her way out there alone with her husband dying in the parlor. The light streaming out into the foggy night and the weird clang-clang-clang of that great bell ever ½ minute. I never forgot that night or the woman all alone there sticking to her husband’s responsible job. For two weeks after the death of her husband, Carry Gifford remained at her post before Wallace Eldredge, son of a Nantucket whaler, came to take charge of the station. The opening of the Cape Cod Canal in 1914 dramatically increased maritime traffic in the area. With Wings Neck situated near the western entrance to the canal, some believed the station was the most important lighthouse on the Atlantic. A lookout at Wings Neck had to watch for vessels nearing the canal from the south, then telephone for a tugboat and pilot to meet and assist them through the canal. For a short period, Louise Eldredge served as the canal’s official day dispatcher and was also responsible for flying storm signal flags. To improve the visibility and audibility of Wings Neck, an oil-vapor apparatus was installed in the Fresnel lens in 1917, increasing the light’s candlepower from 180 to 2,900, and a fog signal building was erected to house a powerful red horn, powered by oil engines and compressors. An assistant keeper was added to the station to help with the added workload caused by the fog signal, and Benjamin W. Joy, brother-in-law of Keeper Eldredge, filled this role. This was ideal as the Lighthouse Service had difficulty finding a contractor to build a dwelling for the assistant keeper. 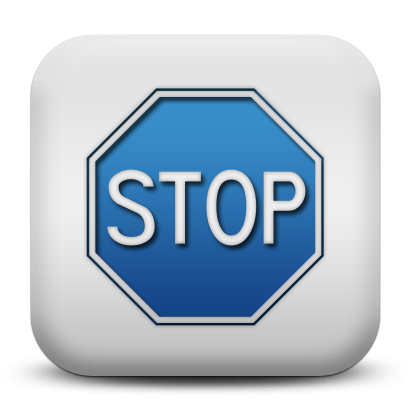 Bids received in 1920 exceeded the budgeted amount, and when new bids were again invited in 1921, none were received. For his excellent service at Wings Neck, Keeper Eldredge earned five Efficiency Gold Stars. When he retired in 1921 at age sixty-five, after thirty-three years of lighthouse keeping, Eldredge boasted he had never “tasted a drop of a doctor’s medicine” during that time, even though once an accident cost him part of his right thumb. George Addison Howard became keeper in 1921, after having worked at other Massachusetts lighthouses, and his brother, William James Howard became his assistant in 1925. George and William, sons of the captain of the Cross Rip Lightship in Vineyard Sound, achieved national fame for their lifesaving. In the first eight months of 1932, they saved eight lives, and William Howard went on to save at least thirty-seven lives during his career. George A. Howard, keeper, and William J. Hoard, assistant keeper, Wings Neck Light Station, Mass., rescued two women and two men when their speed boat sank near the light station on June 19. When the speed boat sank, one woman succeeded in swimming ashore and calling for assistance. The keeper’s son called the assistant, who was on watch. They launched the station boat and put out into the channel. One man, who could not swim, was found exhausted; the other man and woman were found in shoal water, nearly unconscious. An automobile was used to get three of these persons, who were then unconscious, to the light station, a doctor was called, and they were given shelter for the rest of the night. 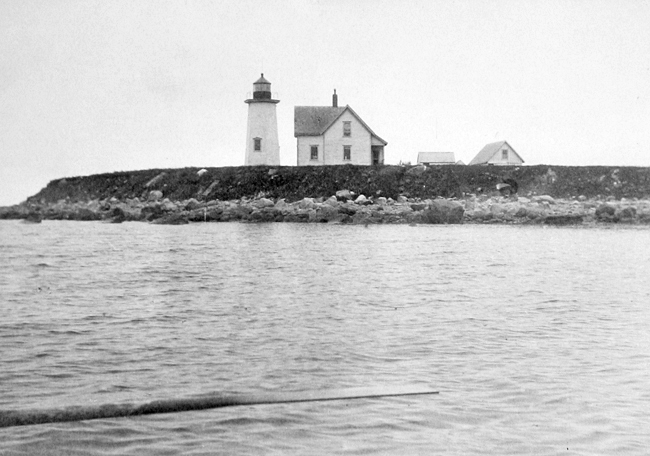 William J. Howard, assistant keeper, Wings Neck Light Station, Mass., rescued a party of five whose sailing skiff had capsized near the station, on July 14. He went to their assistance in the station boat and later provided for them at the station. Genealogical records suggest that the great aunt of George and William Howard was Elizabeth Brown Howard, wife of Edwin Doty Lawrence, Wings Neck Light’s first keeper. 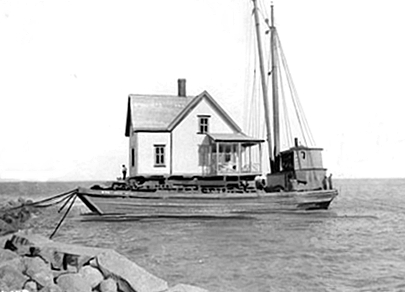 In 1923, the keeper’s house from the now automated Ned’s Point Light was floated across Buzzards Bay to become the assistant keeper’s house at Wings Neck Light Station. This move, along with preparing a foundation and installing a heating system in the dwelling, cost $5,438. The light was changed from fixed to flashing through the substitution of a new lens in 1928, and the beacon was converted to electricity in 1934. With the activation of Cleveland Ledge Lighthouse in 1943, Wings Neck was automated with the fog signal being discontinued and the light being displayed from a skeletal tower. 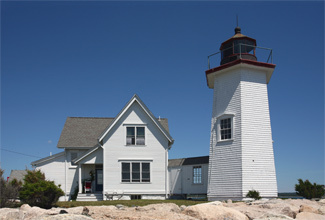 The station’s buildings were sold to Frank Flanagan of Boston in 1947 for $13,738, but Wings Neck Light remained active on the point for several more years. Irene Kelly Flanagan, his wife, enjoyed regaling guests with tales of her surprise when Frank returned home one day to ask, “How’d you like to live in a lighthouse?” The Flanagans were a musical family and often hosted barbershop quartet concerts on their lawn and had as their guests the famous von Trapp family singers of Sound of Music fame. 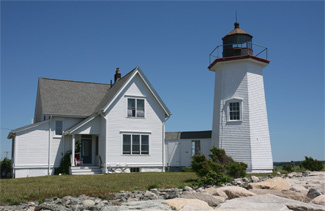 The lighthouse is still owned by the descendants of Frank and Irene Flanagan. Head: Edward D. Lawrence (1849 – 1854), Samuel Barlow (1854 – 1859), A. Wright (1859 – 1861), William King (1861 – 1865), Edward D. Lawrence (1865 – 1887), John Horan (1887), Albert B. Gifford (1887 – 1908), Carry H. Gifford (1908), Wallace A. Eldredge (1908 – 1921), George A. Howard (1921 – 1942), Javan D. York (1942 – 1943). Assistant: Benjamin W. Joy (at least 1919 – at least 1921), William J. Howard (1925 – 1935), Albert R. Wixon (at least 1939 – at least 1940). The Lighthouses of New England, Edward Rowe Snow, 2005. The Lighthouses of Massachusetts, Jeremy D’Entremont, 2007. 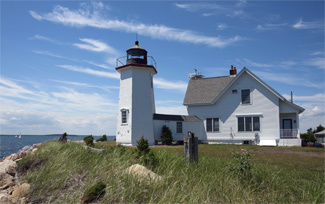 “Lighthouse Keeping,” Coastal Living Magazine, April 2007. “The Presidential Appointment,” Richard Clayton, Lighthouse Digest, April 2008. Located at the end of the Wings Neck Peninsula in Buzzards Bay. For a larger map of Wings Neck Lighthouse, click the lighthouse in the above map. From Route 28 near Pocasset, turn west on Barlows Landing Road. After crossing Shore Road, bear right on Wings Neck Road and follow it to its end. The lighthouse will be to your right at the end of the road. No Trespassing signs prevent a close-up view of the lighthouse. 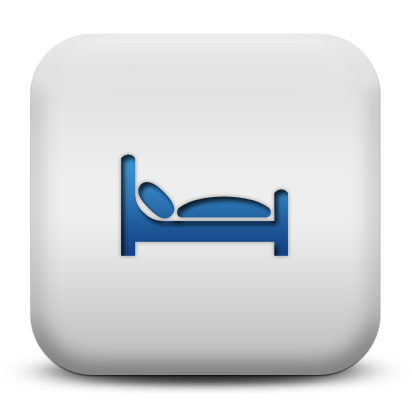 The lighthouse is available for weekly rentals.